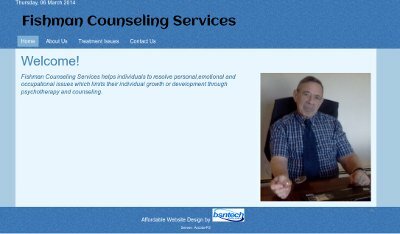 Beverley contacted us a few months ago in regards to creating a website for her husband’s counseling service business. Beverley has been a customer of BsnTech since we helped convert her SFNR Support website from a standard HTML-based website to a content management system which allows her to update the site on her own. The website design progress stalled a bit because Beverley got busy with other things, but we have went ahead and completed the site and published it today! We appreciate the continued business from Beverely and hope we can help with any other projects in the future! Fishman Counseling Services’ website is at fishmancounselingservices.com.